Early Taggart, born in 1903, is nicknamed “Trenchmouth” because his mouth is deformed, teeth sticking out every which way like some horrible monster the likes of which one would find in a freak show. He’s the hero of M. Glenn Taylor’s remarkable first novel, The Ballad of Trenchmouth Taggart. Trenchmouth Taggart, at 108 years old (the narrative begins in 2010), is West Virginia’s oldest living person. He’s being interviewed by Time magazine, and the novel is a third-person rendering of Taggart’s life story as told to the reporter. As is the case with all fine novels, Trenchmouth Taggart is both the story of an individual and the mythic and allegorical fable of us all, something of which Taylor is well aware. Taylor’s work is multi-layered and deeply indebted to literary history, to the Appalachia of Cormac McCarthy and Chris Offutt; to the American Adam heroes of Mark Twain, Washington Irving, Thoreau, and Cooper; to the social novels of Dos Passos, Theodore Dreiser, Jack London, and John Steinbeck; to the magical absurdities of Gabriel Garcia Marquez, Franz Kafka, and Nicolai Gogol. Though the novel is “literary” and informed by literature, Taylor’s prose is so fluid and seemingly effortless that The Ballad of Trenchmouth Taggart bridges the usually irreconcilable gap between popular fiction and literary fiction. It’s that rare creature—a literary page-turner—and it will please both the casual reader and the college professor. How can a person maintain his integrity while avoiding being “bamboozled”? According to Taylor, the only way to do this is by constantly abandoning one’s identity, by making oneself over anew again and again. Beginning with his baptism and consequent change of mothers, and throughout the course of Trenchmouth Taggart’s life, he’s forced repeatedly to change names and change careers and lifestyles. He is variously a snake-charmer, a marksman, a troglodyte hermit, a harmonica player and bluesman, and a newspaper columnist. But everywhere he goes he is trailed by moral decisions he made along the way, including justifiably killing men in the coal mine wars of the 1920s. But as Trenchmouth repeatedly discovers, there’s little room in this world for a moral man. The Ballad of Trenchmouth Taggart is more than just the life story of a mythic folk hero from backwoods West Virginia. 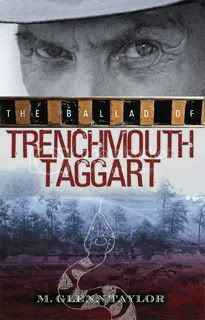 M. Glenn Taylor has meticulously researched his subject—every hillbilly detail strikes as true and sound—and Trenchmouth Taggart’s life intersects with historical events at every conceivable turn, making Trenchmouth Taggart a kind of historical novel as well as social critique and fable. The history it tells is our American history of the twentieth century, the story of a nation ever obliged to make itself anew as a result of moral decisions we’ve collectively made. During a conversation with a fellow journalist, Trenchmouth Taggart says, “All this around us . . . it ain’t real. And as much as we try to find the real and put it down on paper, it can’t be done. There ain’t no real when it comes to writing.” The Ballad of Trenchmouth Taggart might not be “real,” but it’s so very well done that it creates its own reality, and, like the best novels, ours, too. "2008 Fiction Finalist The Ballad of Trenchmouth Taggart, by M. Glenn Taylor" was posted February 15, 2009. Next entry: What Would Philip Roth Do?